My first daughter rarely talks about the occasion nowadays. 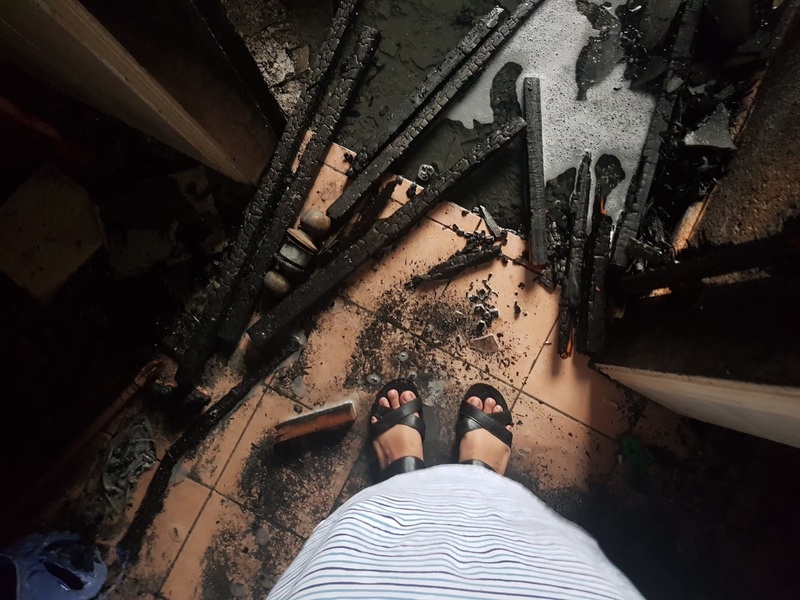 Only once in a while, she will mention about her ''old burnt home''. Which is great because she no longer has nightmares. I taught I was okay, then I realized that my heart is pumping harder than it should every time I think about wanting to cook or for being in the kitchen. I remember how much I used to love cooking dishes for my family and keep sharing recipes here with all of you. Well, I can promise you that I'll try to work on that. I will try to sort this out and one day I'll have the courage to cook again. I know it wasn't my mistake, the hos was loose but then again being there witnessing how big fire can be, how I have put my family in those risk, it can be a lot to be absorbed. This time last year, we have no idea where to sleep. I am always grateful for all the help that my family received. The books, the toys and the clothes given to my kids. I still remember how Sofea cried when she saw her favorite stuff are burnt. I felt like it was my fault she has to experience that sense of loss at such a young age. We didn't plan for many holidays in 2019 compared to 2018. Actually, we only have 2 overseas trips planned for 2019 and the rest are a local trip or short staycation. We have been creative with our weekend activities with kids and it turns out that we don't need to spend lavishly to create memories together. I am in the mist to compile fun weekend activities with a family that is budget friendly. Would you like to read that? I thought that it could be helpful somehow. Our saving was obviously affected after the incident hence we decided to start accumulating our safety net once again. Grateful to even have a saving in the first place. I can't imagine going through the experience with no financial backup. I am so glad that my husband and I have always made it a priority to save. My husband pulls off like a hero. He took care of us, he was there all the time. After all, I am thankful that we now stay in a much bigger and comfortable landed home. We had more rooms than we could occupy LOL actually there are 2 extra rooms that I have no idea what to use it for. I am thankful that my family is safe after the incident, I am thankful for all the blessing that already came and that those that are on its way. Nowadays, when I look at a strong person I always wonder what have they undergoes. I am so glad that this experience leads us to be a better version of ourself. To make every secs count, to really experience the present moment and to prioritize. Okay, that's it for this post. I felt good to be able to pour out and document this journey. To more rewarding adventures in the future! Thank you for spending your valuable time to read this. Thank you for all the love and support. I wish you love and happiness, till next blogpost. This is where I wrote about our home on fire last year, if you want to read it click here.